- D 96089 : "The Vigilante of Pizen Bluff" (Lo$ #6b), from 1996, by Don Rosa (Jesse only, by name only). 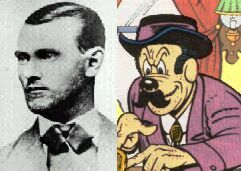 Alexander Franklin James was born on January 10, 1843 in Clay County, Missouri, and Jesse Woodson James was born on September 5, 1847, at the same place. Their father, the Reverend Robert James, was a Baptist minister. They learned to kill during the Civil War, with Quantrill's Confederate Guerilla Raiders. In 1866, they founded the James Gang, along with other men from Quantrill's Guerillas. This gang was responsible of many bank robberies, train robberies and stagecoach robberies from 1866 through 1881. Living under the assumed names of J.D. or Thomas Howard in Nashville, Tennessee, Jesse James lived quite peacefully out of sight from his enemies. He was an outlaw à la Robin Hood. Jesse James was murdered by Bob Ford on April 3, 1882. Frank James died in Kearney,Clay, Montana, on February 15, 1915, after 30 years of life during which he stopped being an outlaw (farmer, shoe salesman, race track starter, circus man,...). Today Jesse and Frank James are among the best-known Americans in the world. They were distantly related to the Dalton brothers. First, in "Only a Poor Old Man", Scrooge, talking about his past life, says he "gummed up the James Gang and outfoxed the Daltons". Then, in "The Doom Diamond", a Beagle Boys evocates them, telling something like "What would theJames Brothers think about poor illicit little burglar like us?" Then, they appear in "The Buckaroo of the Badlands" : young Scrooge is in a train which goes to the West, when this train is attacked by the James Brothers. But Scrooge finally defeats them and the Jesse tells Frank that they should move to Missouri. This story must take place in early 1882, as Jesse was in Boot Hill by spring of that year. Don Rosa put these characters in this story in order to make a reference to Barks' "Only a Poor Old Man". 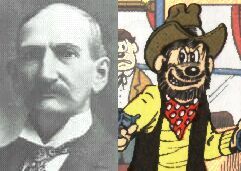 In "The Vigilante of Pizen Bluff", Pothole McDuck evocates Jesse James reading one of the stories he wrote.